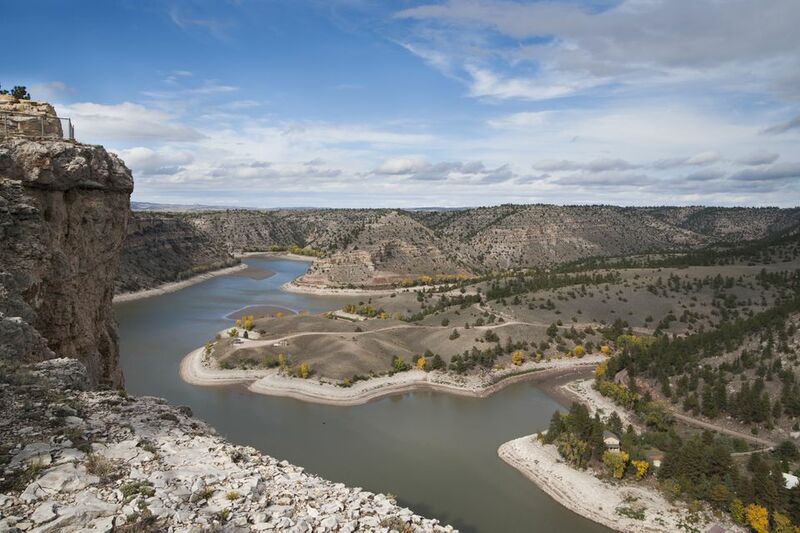 The east-central region of Wyoming, near Casper, offers a number of fun things to see and do. While Casper is the center of population and services, you don't have to drive very far out to find fascinating historic sites as well as opportunities for scenery and outdoor recreation. Like Casper itself, the historic trails of America's westward migration are the focus of many fun places to visit and explore. This important fort began life as a fur trading post and later became a key military facility that supported America's westward migration. The Fort Laramie National Historic Site visitor center offers a film, exhibits, and a bookstore. You can explore the grounds and buildings on a self-guided tour. This large Wyoming state park, which encompasses the entire Guernsey Reservoir, offers a long list of day use, boating, and camping facilities. Hiking, swimming, fishing, and birding are all popular Guernsey Reservoir activities. The Civilian Conservation Corps made significant contributions to the structures and amenities throughout Guernsey State Park. Established in 1867, Fort Fetterman played an important role in the Indian Wars. Visitors to the Fort Fetterman State Historic Site will find a visitor center, restored structures, foundations, and walking trails with interpretive signage. Located at the south end of the sprawling Glendo Reservoir, Glendo State Park is a hot spot for outdoor recreation, offering opportunities for boating, swimming, mountain biking, hiking trails, swimming, fishing, picnicking, and overnight camping. Experience the Oregon Trail yourself at these locations, each an easy drive out of Casper. You'll come away with a new respect for the hardiness and determination of America's pioneers. There's something about the hardships and triumphs of travel along the Oregon Trail that captures the imagination. Here's your chance to stand where they actually stood, to understand the struggles they often faced, and to see the landscape from their actual point of view. A quick hike at this historic site takes you to deep gouges left from actual wagon train traffic along the Oregon Trail. This sandstone cliff that faces along the Oregon Trail retains the "we were here" markings of hundreds of pioneers. In "Westward-Migration time," the Register Cliff State Historic Site is a week out of Fort Laramie; you can now drive the trip in 40 minutes or less. These distinctive cliffs where a well-known landmark among Oregon Trail pioneers, serving as a checkpoint along the journey and providing assurance that they were on the right route to South Pass. Another important landmark along the Oregon Trail, this whale-shaped, light-colored mound of rock lets travelers know that they were on the right track toward their final Western destination. Independence Rock State Historic Site takes its name from the first wagon train to take this particular route. The travelers reached this location on July 4, 1830. During your visit to Independence Rock, you can walk around the entire formation, a route of about a mile. Like at Register Cliff, you'll see many places where the pioneers carved their names, dates, and other information onto the sandstone rock face.